If I had to pick a single theme to characterize Billy Wilder’s work, it would be the individual trapped by unusual circumstances. Sometimes his protagonists would fall victim to traps set up by society (the POW camps of Stalag 17 ) or a handful of ruthless individuals (the gangsters that force Tony Curtis and Jack Lemmon to go on the lam in drag in Some Like It Hot ). But more often than not Wilder’s characters find themselves locked in existential traps partially (or completely) of their own design: Fred MacMurray’s seduction to crime in Double Indemnity (1944); Ray Milland’s alcoholism in The Lost Weekend (1945); Tom Ewell’s feelings of temptation to commit adultery in The Seven Year Itch (1955). 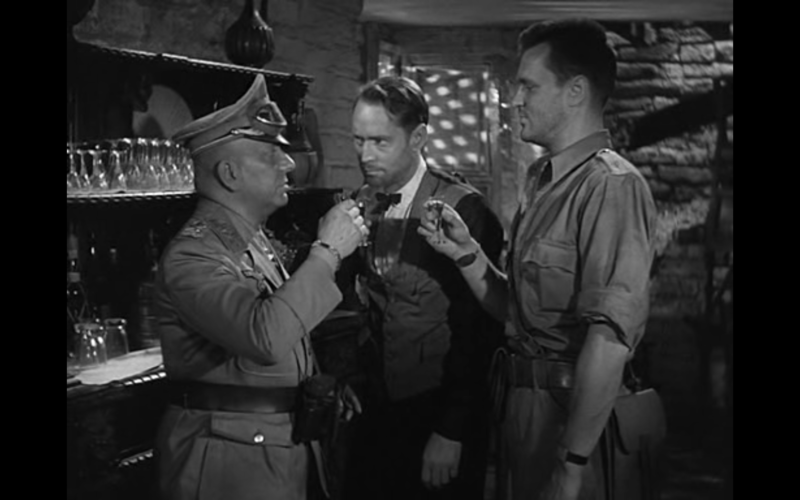 How odd, then, is a little war film Wilder directed in 1943 entitled Five Graves to Cairo which sees its protagonist, Corporal John Bramble (Franchot Tone), ensnared in a two-fold trap: a literal one and an existential one. After an attack in the North African desert, Bramble finds himself as the only survivor of his British tank crew. Delirious from sun stroke, he arrives at an out-of-the-way hotel called the Empress of Britain where he is sheltered by the owner Farid (Akim Tamiroff). 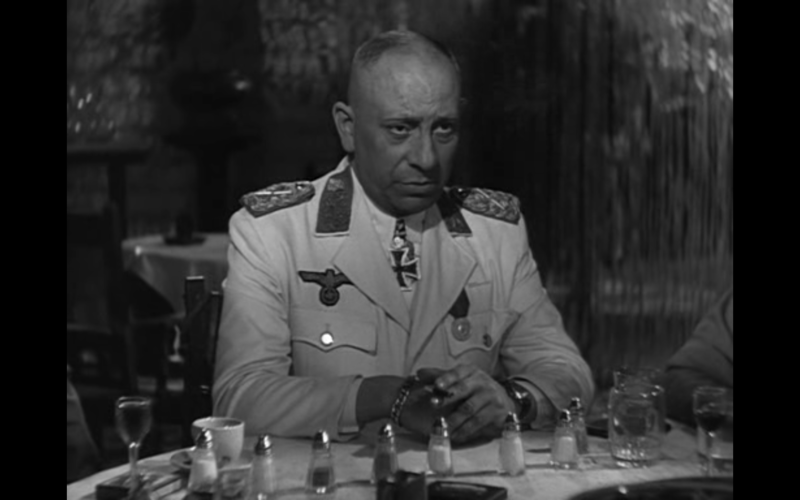 When Field Marshal Erwin Rommel (Erich von Stroheim) rolls into town with his Afrika Korps and commandeers the hotel as his headquarters, Bramble poses as the hotel’s recently deceased waiter Davos. He is called into Rommel’s room where he discovers to his horror that the real Davos was a Nazi spy who funneled crucial military intelligence to the Germans. Thinking quickly, Bramble plays along and learns that Rommel is planning a final, decisive push into Cairo. When a group of captured British officers also arrive, he is ordered to spy on Rommel. Of course, this thwarts his initial desire to revenge his fallen comrades by murdering the “Desert Fox” himself. So here’s the dilemma: he can either reveal himself as a British soldier and be imprisoned; stay undercover, risk his life, and help defeat the Nazis in North Africa once and for all; or murder Rommel and go out in a blaze of suicidal glory. 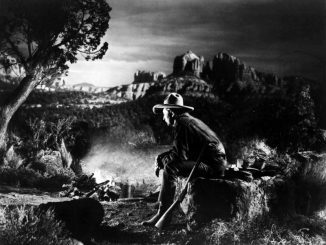 Although he is rightfully remembered for coaxing numerous legendary (and award-winning) performances from such varied performers as William Holden, Humphrey Bogart, and Marilyn Monroe, Wilder’s primary concern was always storytelling. And to that end, the screenplay came first. Working with frequent collaborator Charles Brackett, the film’s script races along like a well-oiled tank to such excellent effect that the audience may not notice that it stars a lead who can barely manage a British accent and a villain whose German accent sometimes becomes Austrian. Considering that Wilder was a native Austrian who lived and worked for a time in Germany, however, it’s possible that he either didn’t notice Stroheim’s wavering accent or simply didn’t think it out of the ordinary. The eventual revelation of Rommel’s plan ranks among the most ingenious that I have encountered in the spy genre. There are moments of tension and suspense that rival anything Hitchcock was doing in his prime, particularly a sequence where Bramble is chased through the lower levels of the hotel during an Allied bombing raid by a Nazi officer who has discovered his real identity. There are two subplots which I don’t believe quite work. The first involves Mouche (Anne Baxter), a Frenchwoman who works at the Empress of Britain. Contemptuous of the British since her brother was abandoned along with his French comrades during the Dunkirk evacuation, she wavers between loyalty to the Allies and to the Axis officers who might be able to rescue her brother from a concentration camp. 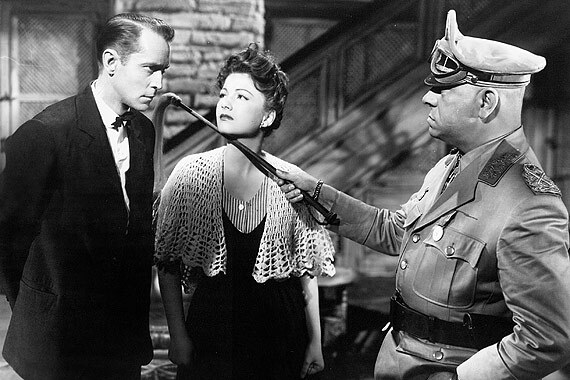 If Wilder had kept the audience in the dark about her true intentions until the end of the film, the subplot would have worked as a complication to Bramble’s mission. But with the early revelation of her motives, it becomes immediately apparent that she exists not to increase tension but to add a “superfluous” romantic element to Bramble’s dilemma. The second subplot involves a boisterous, opera-singing Italian General named Sebastiano (Fortunio Bonanova). Here, the uneasy spectre of forced comic relief, something that would plague Wilder’s oeuvre, rears its ugly head. Why Wilder injected many of his serious dramas with out-of-place comedy, such as the prisoners in Stalag 17 impersonating Hitler and the breaking glass gag from Sabrina (1954), is anybody’s guess. But for a film that involves such astronomical stakes for its characters as Five Graves to Cairo, added moments of levity damage the overall tone and atmosphere of an otherwise tense and taut story, in this reviewer’s opinion. 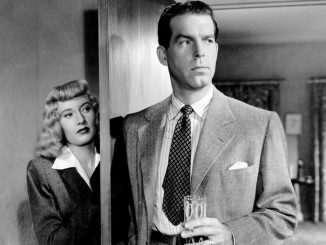 Double Indemnity: The Greatest Film Noir?